Say what you want about Mark Richt's demeanor, but he was right to call out Oliver. He challenged a reporter to say something to his face that clearly the reporter, who is well known for his bashing of Richt, Murray and Georgia, wasn't comfortable doing while he wasn't safely ensconced in his studio. I say good on him. You can take that stance, but Richt challenged him to say it to his face and to own that sentiment, something Oliver wouldn't do, despite doing so many, many time while not in Coach Richt's presence. For those that say he 'stormed' out or 'stomped' out, well, I guess you have to get hits to stay relevant. I love that Richt came back and said what he had to say then dropped his mic and exited. Chuck being a UGA basher is news to me. If I recall correctly, he was one of the few that picked UGA to beat Florida and echoed it would be UGA in the driver's seat to make the MNC game after beating Florida. F Chuck Oliver and his worthless show. I'm done with it. I agree with the previous comment. Olver doesn't have the stones to ask a question directly. I commend the Coach for supporting his players and calling Oliver out. Chuck Oliver is a douche bag and I love how Richt handled it, BUT, he's right. Truth hurts. I love Georgia damn near like a baby, but we choked at the end after magnificent effort. The coaches let the players down - again. Spike the ball and take two shots at the end zone - it was that easy. It's just so utterly frustrating to lose like that - on a hurried tipped pass at the end. Damn. Just damn. Hell, I don't know. Now that I've read the comments on the decision not to spike it, I can't criticize. I'm just so disappointed - but proud to be a DAWG, as always. Chuck Oliver is a sad excuse for a radio host. Let the folks who advertise on this station know that you are done with him and the station once and for all. I sure am. What a coward. What a loser. After one of the greatest games ever this is what he comes up with? Loser! Oliver also bashed that UCLA reporter for doing similar "reporting" earlier in the week. Good on Richt for that. That will earn him more points for sticking up for his players than just about anything else. Similarly, King Douche Finebaum called Richt 'petty' for coming back to the podium. That's as ridiculous as Oliver's question. Your team loses a game like that, and you have to field that question? I'd be mad as hell too. It was petty. The fact that Finebaum commented speaks volumes. As for the final play call, it was not that bad at all. I probably would have spiked it but I can understand not giving Bama a chance to regroup. It is very easy to armchair that one. People making it out like this was horrible play calling are clueless. It didn't work because the Bama lineman made a great play. Had he not tipped it, worst case is that it is incomplete and there are 7-8 seconds left. I have listened to Chuck for years. I've never considered him a UGA basher. The only problem I've ever really had with him was his lack of objectivity and refusal to see what 99% of America saw in the Auburn/Newton case, regardless to the NCAA's "findings." I have heard him defend Richt and Murray before when UGA fans (I'm just as guilty) themselves criticize them. I honestly thought Chuck was trying to give Richt a chance to respond to that at perhaps the best time of Richt's career. I did not see it as an attack. wow chuck has a show? must be on some weak signaled AM station... Mark basically said, Speak up and talk to me like a man and I'll address it, if not.. STFU!! Big ups to M.R.!! I don't think of him as a UGA basher; he simply lacks honesty, integrity, class and balls. 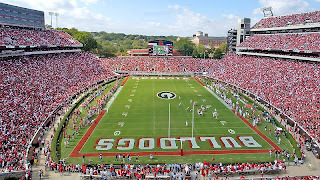 Before the season opener against Buffalo he repeatedly questioned Richt's integrity because Richt did not enforce UGA's mandatory suspension policy for Branden Smith's arrest. When it was pointed out that UGA has no such policy did he get on the air and correct his error or apologize to Richt? Of course not. 92.9 FM in Atlanta is now sports talk. I'll be checking them out. Steve - I'm willing to assume it wasn't a poorly veiled attempt to attack Richt and the Dawgs... He'll, maybe it was an attempt to let Richt send a response to 'those people'. But it was the wrong time. He just rubbed salt on an open, festering wound and was bitten back. I don't feel sorry for him, but I'm willing to accept that he didn't mean anything by it. Either way, he should have not brought that up at the post game presser. Chuck's question probably wasn't appropriate, but he is certainly right. I'm a Tech Alum, and I can't believe how much criticism I hear from Dog fans toward both Richt and Murray - on the radio, on the AJC blogs, etc. Good for CMR to stand up for himself and his players. But that really should be directed at the so called UGA fans, not at Chuck. Didn’t we BEAT Florida last year and this year was BIG (they were ranked #2). You know you have to actually play in the big game to have the opportunity to win or lose it...just saying.